Seattle restaurateurs are weathering the recessionary storm by changing things up to suit the times, doing what it takes to keep their businesses alive and well. Among them are Ludger Szmania and his wife Julie. This month, they re-branded their 20-year-old Magnolia restaurant, now known as Szmania’s Steakhouse & Bar, where you may still sit at the open kitchen counter and score a plateful of spectacular jager schnitzel. With summer at hand, Philip Mihalski introduced a casual “Weekend Patio Menu” at his Green Lake restaurant, Nell’s, taking advantage of daylight hours and proximity to the summer fun. And the closure this week of the cocktail lounge Licorous on Capitol Hill leaves John Sundstrom more time to concentrate on his award-winning restaurant, Lark. Since Szmania’s debut in 1990, Ludger Szmania has opened and closed a Kirkland outpost, remodeled the original several times and have now changed-up his menu entirely. The latest redo puts a greater emphasis on the bar, while the meaty sizzle is meant to divert customers who might otherwise head downtown for steaks. 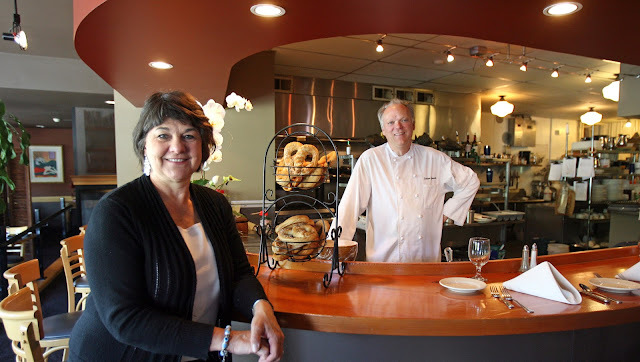 “When we opened Szmania’s, it was the hot place to go,” the German-born chef recalls. “We used to be a destination restaurant,” with a majority of customers trekking from the Eastside. These days, there’s no need to cross two bridges to find a great neighborhood restaurant, he says, and competition is stiff. Chef Philip Mihalski, foreground, keeping an eye on things at his Green Lake restaurant, Nell’s. Outside, in view of Green Lake, Seattleites are dressed in their fun-day best. For them, Mihalski has crafted a “more approachable” menu served from 3 to 5:30 p.m. on Fridays and Saturdays and from noon to 5 p.m. on Sundays. Now, the shorts and flip-flops crowd can stop by for a nosh on the patio (or come inside if it’s raining), and try his grilled salmon ($9) or a grilled cheese with bacon and tomato ($5.50). Mihalski sees dipping his toes in the lunchtime waters as an opportunity to capture a few extra bucks and the attention of patrons who might return for dinner. “Seattle,” says chef John Sundstrom, “is a real dynamic food community, and the foodie crowd are always interested in what’s new.” They came in droves when he opened Lark in 2003. And again when he opened a little cocktail lounge across the alley, serving geoduck ceviche and foie gras bonbons. But “foodies” are a fickle beast, especially when times are tight. Chef John Sundstrom, seen preparing a feast for “foodies” at the Fred Hutch Premier Chefs Dinner in May, closed Licorous Monday night after a solid five-year run. “We’re not the new guy, so we have to be proactive,” he says, by offering “small incentives,” like a discount coupon from Rue La La. Or bigger, more important ones. “We have the advantage of having great loyal customers who know us as someone you can trust.” But while things are improving economically, “it’s not going gangbusters,” Sundstrom admits. Hence the closure of Licorous. “We had a juncture in our lease”– a stay-in or get-out option that allowed them to “get out gracefully,” says Sundstrom, who’s turning the lounge over to one of Seattle’s top bartenders, Jamie Boudreau. Boudreau will soon open Canon, a so-called “whiskey and bitters emporium” in its place. 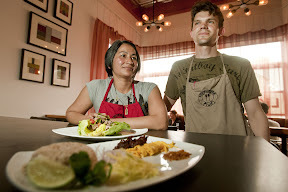 Lark sous-chef Wiley Frank (at left) and his wife, PK, “borrowed” Licorous Monday nights for their pop-up-restaurant sensation, Shophouse. Shophouse fans can find them cooking Thai street-food Wednesdays at the Columbia City Farmers Market. [Seattle Times photo/Dean Rutz]. Jamie Boudreau, right, seen doing what he does best. 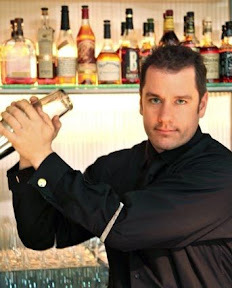 Finally securing a bar of his own is big news for Jamie — and for Seattle’s cocktail culture. .